To reap future growth benefits, companies must smash through the traditional confines of industry walls to seek collaborative opportunities that stretch across multiple business sectors. Until recently, the concept of standalone industries made sense. From the Industrial Revolution on, the world’s economy has consisted of dozens of compartmentalized collections of companies, each serving its own markets, teaming up with its own suppliers and pursuing its own ways of capturing value. In more settled times, this paradigm worked well; staying within an industry’s established lines of business and ways of doing things made competition comparatively straightforward and was the normal path to profitability. In fact, lacking today’s digital means to change the game or global opportunities to form new business models, breaking out of the industry box was all but impossible. Today, however, disruptions in everything from the flow of raw materials to the nature of end markets have conspired to knock even well-rooted industries off-kilter. Fortunately, companies have a variety of technology-enabled ways to smash through the confines of industry walls and unlock new value-laden synergies in pursuit of collaborative opportunities that stretch across multiple business sectors. Cross-industry collaborations can be structured to meet multiple objectives, such as reaching the digital consumer or mastering mobile commerce, and can span multiple industries. Welcome to the bold new world of business ecosystems, a term first coined two decades ago by James F. Moore, an expert on leadership and change in large-scale systems, in a Harvard Business Review article. Instead of being rigidly grouped around a specific business or branch of manufacturing, ecosystems draw together mutually supportive companies from multiple industries that collectively seek to create differentiated offerings and capture value they could not reach alone. Consider, for instance, how Apple leads an ecosystem that spans at least four industries—personal computers, consumer electronics, information and communications—and now encompasses even more, such as music and TV (see chart). Because of today’s advanced connectivity solutions and value-laden emerging markets, many companies have never been better positioned to engage in multi-industry collaborations. But few have broken out of the static industry box. They had better figure out a way to do so soon. Several Accenture studies suggest that future growth opportunities will increasingly emerge outside a company’s traditional business. 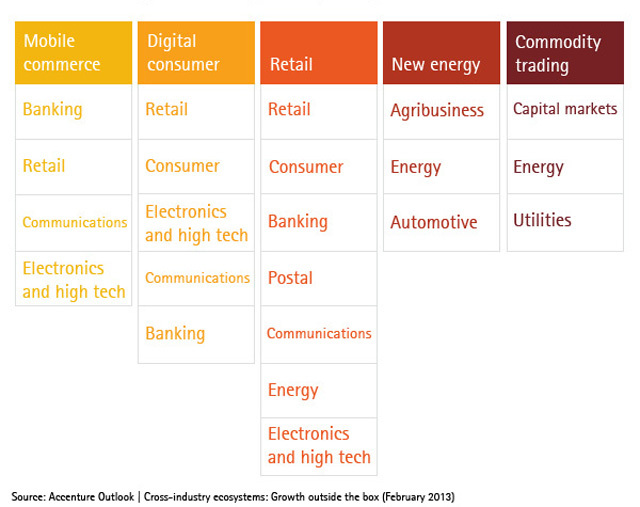 And each of these opportunities will require disruptive new approaches and collaborative models. Meanwhile, the new competitive dynamics will be shaped by two important factors. The first is collectively known as Big Data—increasingly vast pools of information that empower companies to link previously distinct industries. But even though Big Data is blazing countless fresh paths to growth, in many cases, companies need new ecosystem partners to pursue them. These cohorts can help make up for a lack of internal competence or provide access to information. What’s more, the intimate knowledge housed in an organization’s customer databases can open potential new revenue streams beyond a company’s core business. The pursuit of new business opportunities depends on the availability of increasingly scarce financing, which is the second factor shaping the new competitive dynamics. This scarcity, along with the instability in financial markets, is spurring the emergence of innovative ways for companies to obtain the capital they need. At the same time, burgeoning public debt is forcing governments to reposition themselves as project initiators that depend on outside sources of funding when it comes to public-sector procurement. (see Sidebar). Sharing costs and risks has therefore become a necessity for both private- and public-sector companies. For these new multi-industry collaborations, opportunities will be found in three broad areas: emerging markets, the environment and maturing Western markets. Emerging markets are expected to drive up to 70 percent of future growth for multinational corporations. But penetrating these markets can present serious obstacles for most companies. In many cases, organizations will need to develop innovative business models to meet specific local market needs. Leading companies no longer view environmental concerns as a barrier to growth, seeing them instead as opportunities to be pursued with partner enterprises. The new sources of growth being created by environmental issues often require a collaborative strategy that crosses industries. For example, offerings focused on energy efficiency are already being created by ecosystems of energy providers, technology providers, construction companies and more. Maturing Western markets still contain significant numbers of sophisticated, affluent consumers. Instead of writing off these markets, companies need to capture value by pursuing new sources of competitive differentiation. Positioning an organization as an innovative market disruptor can be both risky and difficult, but it remains one of the best ways to generate significant profitable growth. These growth opportunities have been spotted by a number of organizations that have already seen the benefits of collaboration and have created cross-industry ecosystems. Consider so-called smart cities. In the Netherlands, the city of Amsterdam teamed with energy network company Alliander, telecom operator KPN and city-affiliated agency Amsterdam Innovation Motor (AIM) to create an experimental cross-industry public-private ecosystem to reduce the city’s carbon footprint. Looking beyond a basic commitment to funding clean infrastructure, the project partners built a platform where a diverse array of different-size companies can share expertise and jointly lead projects to improve urban living, working and mobility, and, at the same time, reduce the impact these projects have on the environment. Electric vehicles also offer a compelling illustration of how cross-industry ecosystems can usher in major paradigm shifts. Better Place, a venture capital-backed company, is structuring a new collaboration that ranges from the development of EVs with removable batteries by automakers to the installation of networks of battery charging and swapping stations. Better Place wants to introduce a totally new transportation business model by positioning itself as the provider of an end-to-end network and service solution for electric vehicles. The company has established an ecosystem that links public authorities, which support development through tax credits; automakers, which develop EV technology; battery suppliers; energy suppliers; and investors. At the same time, disruptive initiatives involving multiple industries are transforming the way we travel. Some ecosystems have already successfully deployed tools like location-based smartphone apps in airports. The “My Way Aéroports de Paris” smartphone app enables Paris-Charles de Gaulle Airport terminals and Android smartphone providers to collaborate to help travelers navigate their way to airport shops, restaurants, parking terminals and, ultimately, their flights. Other companies could develop ecosystems using location-based technology as well. Clothing retailer Gap, for instance, in partnership with a credit-card company, has introduced the Gap Mobile4U location-based service for text-enabled mobile phones, which sends Gap customers text messages with personal offers for deals at the nearest store. More generally, highly diverse segments of the population have come to expect uninterrupted connectivity and virtual interaction. As a result, consumers no longer perceive travel as a solitary experience; regardless of age or whether their trip is for business or pleasure, today’s travelers want to be connected throughout their trips. Transportation providers, Internet service providers and a vast array of other businesses can collaborate to enhance the travel experience and address this emerging trend. Successful cross-industry ecosystem plays will differ markedly based on whether they are in emerging or developed markets. Emerging markets offer particularly fertile ground for developing cross-industry ecosystems, in part because ways of doing business and customer expectations both tend to be more flexible than those in developed economies. In some emerging markets, for example, many consumers have long preferred mobile over fixed-line telephony due to the decrepit state of most landline networks. As a consequence, companies have an easier time launching such cross-industry plays as mobile payments or e-healthcare. In Pakistan, Telenor Pakistan partnered with Tameer Microfinance Bank in 2009 to introduce branchless banking for the first time to the country. Launched under the brand Easypaisa, the service is available to anyone in Pakistan through any authorized shop, Telenor Franchise, Telenor Sales & Service Center or Tameer Bank branch. Customers can, among other things, pay bills, send and receive money from either within the country or from abroad, purchase airtime for their handsets and open a mobile bank account. Currently, there are 18,000 Easypaisa shops operating in 700 cities across Pakistan. Health services players have adopted an innovative model that integrates information and communications technologies with healthcare to create new value for patients and caregivers alike. In Mali, ecosystems of telecom and healthcare partners have introduced remote X-ray image analysis performed at often-distant regional hospitals. Alcatel-Lucent, Fondation Orange Mali, Afrique Initiatives, Medicament Export (Medex) and Kafo Yeredeme worked together to develop Pesinet, a service that offsets the country’s shortage of doctors by greatly reducing physicians’ need to travel, allowing them to focus on diagnostics and advice from afar. Partnering with the Ministry of Health in Mali, Pesinet provides remote access to primary healthcare for children by capturing data and transmitting it over the GSM mobile network to doctors for offsite monitoring. In mature, extremely competitive markets, cross-industry collaborations need to create significant value or they will likely fail. Energy performance contracts provide a viable example of what works. These contracts add value in what may seem like static markets—buildings are already constructed, customers have existing agreements with their utility and consumption patterns are established. With a performance contract, however, an ecosystem of partners, typically from the energy, construction and financial services industries, commits to reducing a home or building owner’s energy bill, carrying out any necessary refurbishment or upgrades of energy-efficient equipment and systems and encouraging behavioral changes to reduce consumption. If energy consumption is lower than the target set by the owner in the contract, the company or ecosystem managing the contract receives a performance fee. An effective energy performance ecosystem will focus on results rather than resources. It will deploy expertise in new construction and energy installations, and offer a financing solution (with the investment repaid by the resulting energy savings) as well as an insurance solution (given the uncertainty of the gains). Germany has been a pioneer in this type of contract, which is now being adopted in other countries. These approaches remain experimental and are not easy to get right. To succeed, it is essential for service providers to develop innovative tools, techniques and expertise that can reduce the customer’s energy consumption even more than expected. Although cross-industry initiatives have already proven their value, most companies still have not created an ecosystem. Here are some suggestions for jump-starting these partnerships. A successful ecosystem requires strong governance. Significant project resources must be allocated to forging links among partners, which means much more than simply ensuring that everyone is aligned with common objectives or when resolving conflicts. At each stage, project managers need to make use of the wealth of stakeholder expertise to multiply the value created and address issues as they arise. Project managers must also ensure open access to data and find innovative ways to use the collective database. A balanced collaborative project management model will include several elements. Objectives and timelines must be clear and shared, for example, and the remuneration for each of the partners needs to be spelled out. In addition, leaders must authorize all trials and pilot initiatives. Moreover, a systematic approach and specific tools will be essential for key project components such as business case management. In particular, project managers need to shepherd the creation and implementation of forward-facing business models that align with the interests of all stakeholders. Information systems play a fundamental role in deploying and operating these new ecosystems. An open information platform enables companies to integrate the critical components of a smart city or other ecosystem and make them “interoperable” across different systems and stakeholders. State-of-the-art solutions also include cross-functional information platforms that are hosted in the cloud and available as a service. This approach has multiple advantages: New features and services can be deployed faster, the platform’s partner companies do not need to build their own systems and all can access cross-industry data regarding their common end customers. As a result, the information system is no longer simply a function but rather a customer-centered growth driver. What’s more, the entire ecosystem needs an entrepreneurial dynamic and a “test and learn” philosophy that sees trials as learning opportunities. That means pursuing several possible scenarios at once, welcoming new ideas and innovative concepts, and acquiring the knowledge needed to implement them. The key to a successful disruptive strategy lies in the ability to manage the different aspects of these explorations and to chart a course to concrete, viable results. This strategy works best when a fully engaged top management team empowers a leader to meld the different and often far-flung elements of the ecosystem into a cohesive whole. The Amsterdam Smart City platform, for example, spans a range of urban planning and environmental projects. A pivotal clause in the partnership agreement stipulates that the platform must act as a vehicle to cascade best practices among partners, small and medium enterprises, industrial companies and local authorities. The platform is “open” not only because it allows information exchange and participant involvement but also because it ensures that interdependencies and loyalties between partners are taken into account. Being open also enables the platform to support the development of differentiating business intelligence and analytic approaches. Being part of an extended, open ecosystem supports a shift from a sense of ownership—of customers, suppliers, innovations—to a collaborative, networking mindset that wants to develop ideas and share successes. A variety of possible alliance structures exist, each having a larger or smaller impact on their member organizations. Integrating an appropriate, flexible ecosystem can represent the first step toward this new strategy, avoiding the often-costly process of fully merging with a partner that might have a fundamentally different culture and operating model. While reports of the demise of traditional industries might be greatly exaggerated, new opportunities to reach across industries to capture growth unavailable within traditional sector confines have become feasible for a growing number of companies. Even though the strategy is in its infancy, companies have only a limited timeframe to lock in desirable partners and build sustainable ecosystems. For many leaders, moving out of the industry comfort zone can be a difficult decision, but changing market dynamics and increased pressure on growth can make it a necessary one. Although originally, multiparty, cross-industry collaboration mainly consisted of public-private partnerships, it actually encompassed a wide variety of different models. More than half of these partnerships in emerging countries between 1990 and 2001 involved cooperation between the government and the private sector that was limited to the founding contract. These agreements also included technical and quality objectives, although they were secondary to the initial issue of financing. Today, traditional public-private partnership contracts are considered too complex; they are also considered inflexible because they lock participants in for extended periods (often 20 to 60 years), making it extremely difficult to adapt to unexpected shifts in technology or environmental concerns. In the area of municipal services, however, an entirely different approach is emerging. Cedric Vatier leads Accenture’s Strategy and Sustainability groups in France, Mauritius, Belgium, the Netherlands and Luxembourg. He is based in Paris.